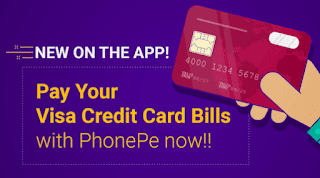 PhonePe App – Get Rs 75 Cashback on First ever Visa Credit card Bill Payment. PhonePe is back with an awesome deal and offering Flat Rs 75 Cashback on your 1st ever Visa credit card bill payment of Rs 1000 or more. Offer is valid from 00:00 hrs on 22nd May, 2018 to 23:59 hrs on 31st May, 2018. Valid for once per user. So Hurry up and avail this Offer Now !! 7) Now Initiate a First ever Visa Credit card Bill Payment of Rs 1000 or more. 8) Enter your Visa card number and IFSC Code. 9) Pay the amount via UPI only. 10) You will get the Flat Rs 75 Cashback in your phonepe wallet. Offer can be availed only once per user on first ever Visa Credit Card Bill Payment. Once Bill Pay is Processed , it cannot be cancelled or returned.